2008 Amelle Zinfandel Buck Hill Sonoma County: Retail $24. What more can I say about this wine that I have not already said? This is the one wine in the basement that my wife has requested free reign over–she wants ‘permission’ to go down at any time and pull one of these when I am not around. It is so good that I denied her request (not really, but it sounds a whole lot better than ‘I caved to my wife. Again.’). Outstanding. 92-94 Points. 2006 Beringer Vineyards Chardonnay Sbragia Limited Release: Retail ~$35. I bought these a few years ago and even paid close to retail (which I hate doing). I did not pop the first of them until this week, and I ended up going through all three. Why? In an odd twist on Goldilocks, the first two were flawed–the first was badly oxidized and the second was corked, but the third was ‘just right’. A big, buttery, oaky Chardonnay that is certainly not my preferred style, but after the first two expensive bottles of ‘Drain-O’, I met the third with welcome relief. Very Good to Excellent (the third bottle). 88-90 Points. 2001 Domaine Chandon Étoile Rosé: Retail ~$35. I bought these a couple of years ago and this was the first we had popped. Pale pink effervescence discovered under the crown cap. Good subtle strawberry and cherry fruit, with well balanced acidity. This lacks a bit of the yeastiness that is associated with champagne, but this is still a pretty good wine for the price (or at least what I paid for it: $14). Very Good. 86-88 Points. 2005 Patient Cottat Sancerre Rouge: Retail ~$25. Pinot is made all over the world and this one comes from the Loire Valley–a region that few consider a ‘hotbed’ for Pinot Noir. But I love Pinot from all regions. Except when it is corked. Like this one. Really corked. More ‘Drain-O’. Ugh. 2007 Failla Chardonnay Keefer Ranch: Retail ~$40. There are few wines where I will regularly pay full retail, but Failla is certainly one of them. Failla remains on my short list of reliable, go to wines that will likely knock my socks off. This was no exception. Great fruit on the nose with some vanilla and spice. On the palate, this wine envelops and soothes with verve and balance. Ehren Jordan does a great job with Pinot, but I think he really stands above most with his Chards. Outstanding. 91-93 Points. NV Jean-Noël Haton Champagne Brut Classic: Retail ~$30. We picked these up from the PLCB for just under $30/bottle ‘on sale’. (Then I noticed that the average value on Cellar Tracker was $25. Man I hate the PLCB). Very nice acidity and mousse, a bit lacking in fruit, but this is quite serviceable as an every day type of bubbly. Very Good. 87-89 Points. 2005 Helfrich Gewurztraminer Steinklotz Grand Cru: Retail ~$25. I just do not drink enough Gewurz. I tend to buy a bunch to pair with my wife’s Asian cooking, but since Alsatian versions tend to age so well, I hold on to them tighter than my son clings to his last lollipop. Classic Gewurz nose and palate with plenty of fruit and residual sugar. Really a fantastic wine. Excellent. 89-91 Points. 2004 Littorai Pinot Noir The Haven: Retail ~$70. Popped and poured. I have another bottle of this and I really need to decant it first as it was exceedingly tight upon opening. After the first glass, the dark cherry fruit really started to show. This is one of the more intensely dark red fruit Pinots that I have ever had. By the end, this was truly singing and had a depth and complexity for which Ted Lemon is known. Outstanding to Incredible. 93-95 Points. 2007 Novy Family Wines Syrah Susan’s Hill Vineyard: Retail $32. We are huge fans of Novy/Siduri and it is one of the wineries we rarely miss on our trips out West. Popped and poured. This was very tight upon pulling the cork, with a very muted nose and palate. After a bit of time, though, it really opened up nicely with really dark fruit (blackberries) and even a bit of mocha. After initially a bit astringent, it rounded out nicely and expressed fine balance. I think it needs a couple of years still. Decant for at least an hour at this point. Very Good to Excellent. 88-90 Points. 1996 Taittinger Champagne Brut Millésimé: Retail ~$60. A very nice vintage champagne from a great year. Rich and creamy with citrus and brioche competing for attention. Lively mousse tickled the nose and the palate. Long tantalizing finish. Outstanding. 90-92 Points. WINE OF THE WEEK: This was a rather rare week–I had three bad bottles. I guess the law of averages is finally catching up to me (most estimate that about 10% of wine is corked) since I have been mostly flaw free for a while now (I am talking about the wine I have been drinking, personally, I have countless flaws–including my near constant need for self improvement, counseling, and plastic surgery). Up until the 2004 Littorai The Haven (which we had with good friends on Saturday), I feared that ‘flawed wine’ would be the WOTW. The Haven was truly remarkable–I can not remember ever having a Pinot that was refined and reserved but yet had such intense and deep flavors. My highest rated wine in almost a year. I have one more bottle and if I remember to decant the next, I would not be surprised if it gets even better. 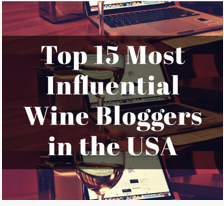 This entry was posted in Champagne, Wine and tagged Amelle, Champagne, Chardonnay, domaine chandon, Gewurtraminer, keefer ranch, Littorai, Pinot Noir, Siduri. Bookmark the permalink. Very nice! And great review! Agree . . . the Littori is a beautiful wine! And I love Gewürztraminer. Because it’s almost as much fun to say as it is to drink! Salud! 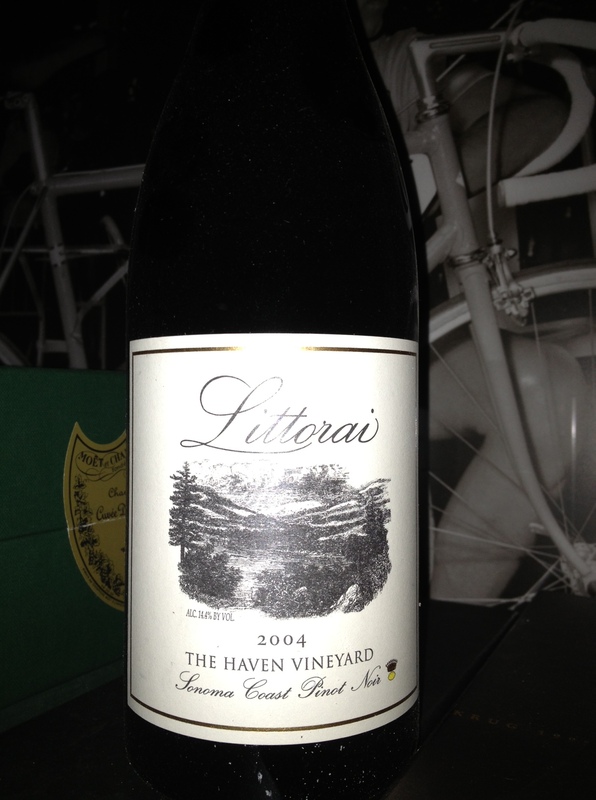 Littorai is always impressive, chard and pinot…. Thanks for all the likes. I used to ride lot, but not so much anymore. No more dropped bars. I also like wine, but rarely buy the “good” stuff. You might have noticed I visited the vineyards around Cape Town SA last month and Napa in December. Anyway, I enjoy my visits to this blog. It’s different and you definitely have a concept. Ron, I really love your site–excellent photos…. As I’ve said before, I want to be your neighbor. Well, with the proposed tax increases in Philly, we might be moving soon….